Wilderness survival or bushcraft, to give survival it’s more trendy name, is about using the knowledge and skills once common in the countryside and in indigenous cultures to survive and thrive in the wilderness and countryside on nature’s own terms. For me personally, it is also about a deep spiritual affinity with the natural world at the heart of which dwells Pure Truth. On another level, the self reliance fostered through the honing of practical survival skills breeds self confidence as well as an ability to solve problems and engineer solutions under sometimes difficult circumstances. The benefits of this can be carried forwards into the work place and other areas of conventional life. This is especially true of those of us who are largely self taught. Those genuinely spending a lot of time outdoors doing it for real can also usually maintain a high level of physical fitness without the need for additional exercise. They are also less likely to suffer from stress and other modern afflictions. 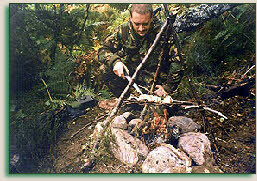 I began to take an interest in backwoods skills in the late 1970s after reading the book, ‘Bushcraft, A Serious Guide To Survival And Camping’, by Australian survival expert Richard Graves. I still regard this as being an excellent book and quite possibly the ultimate source of the term, ‘Bushcraft’ used by others in the UK. 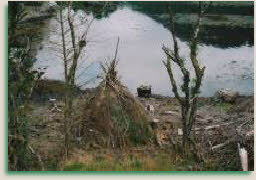 I was also briefly a member of the Scouts and led an outdoor childhood. It wasn’t until the 1980s however that I really began to study survival skills seriously alongside martial arts such as Wing Chun and Ninjutsu. This period of my life brought me into contact with John ‘Lofty’ Wiseman of ‘SAS Survival Handbook’ fame, another seminal work often, (poorly in my opinion), copied by others. Lofty is the only person I ever received any formal survival training from. In a world of five minute experts in everything, I regard lofty as the real thing and still have considerable respect for him to this day. I also hold in high regard the many poachers and old school artisan country crafts people, some now sadly deceased, that I have been fortunate to ‘break bread’ with. 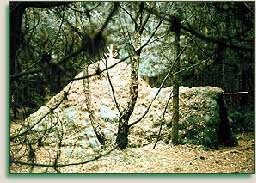 They have taught me things that cannot be found in books and long before the bushcraft bandwagon rolled into town, their kind were using many of the skills I shall be detailing here out of a genuine need for self reliance. Their kind also sadly grows ever fewer. Despite visiting the Arctic, (the hard way), in more recent years, I still believe that the UK, Scotland in particular, offers some of the best wilderness survival possibilities anywhere. At a time of growing environmental concern and the greater expense and hassle associated with air travel, there is no need to be jetting off to far flung corners to find solitude. 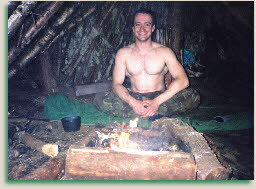 Nor is it necessary to pay out large sums of money to attend one of the latter day bushcraft schools to be spoon fed basic techniques that anyone with a bit of gumption can fathom for themselves from the afore mentioned publications, some well chosen field guides and personal reference sites such as this. These are fundamental skills open to those prepared to put the time and effort in. Finally, despite teaching others at various times in the past, I am not going to claim to be any kind of expert. The fact that I am still here after nearly 30 years of often SOLO wilderness activity will speak for itself. The opinions therefore expressed here are my own personal views and as such should be taken or left as you wish along with the following skills which have allowed me to enjoy the outdoors to the full. I will not be held responsible for the actions of those who become statistics due to experiencing a common sense failure. Always work within the limitations of your knowledge and experience.